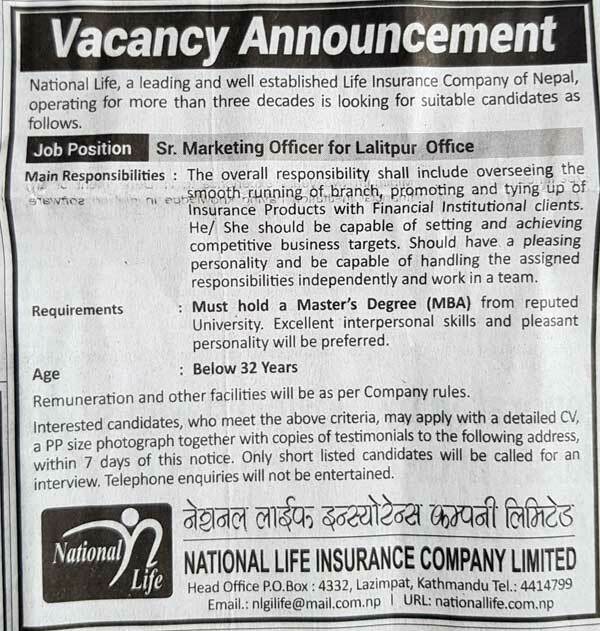 National Life, a leading and well established Life Insurance Company of Nepal operating for more than three decades is looking for suitable candidates as follows. Main Responsibilities: The overall responsibility shall include overseeing the smooth running or branch, promoting and tying up of Insurance Products with Financial Institutional clients. He/she should be capable of setting and achieving competitive business targets. Should have a pleasing personality and be capable of handling the assigned responsibilities independently and work in a team. Must hold a Master’s Degree (MBA) from reputed University. Excellent interpersonal skills and pleasant personality will be preferred. Remuneration and other facilities will be as per Company rules. Interested candidates, who meet the above criteria, may apply with a detailed CV, a PP size photograph together with copies of testimonials to the following address, within 7 days of the notice. Only short listed candidates will be called for an interview. Telephone enquiries will not be entertained.